Cocktail Making is the ultimate way to start your hen do celebrations. Join us for a boozy afternoon in central Cardiff to learn how to mix your favourite cocktails, sampling quite a few along the way! Upon arrival, the boozy scene will be set with a glass of bubbly for all of your hens. 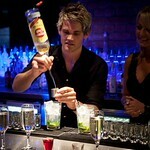 Then our professional bar tender will mix five or six classic cocktails for everyone to sample. The bar tender will also give you a bit of history about the cocktails and share some tricks of the trade, something to take away from the hen do! The lesson gets practical as you and your hens go behind the bar to make at least two cocktails each. You can enjoy these sitting at the bar afterwards. No hen party is complete without some vodka shot games, which come next and if you haven’t had enough already, there are more drinks before you leave! This package also includes some party food for you to nibble on throughout the afternoon and a dessert, so there is something to soak it up! It really is the perfect hen do afternoon of fun. This cocktail making lesson lasts about one and a half hours. It starts at either 14.00 or 16.00. The minimum number of hens for this package is 10. If you are under 30 (or look under 30!) please bring some ID.